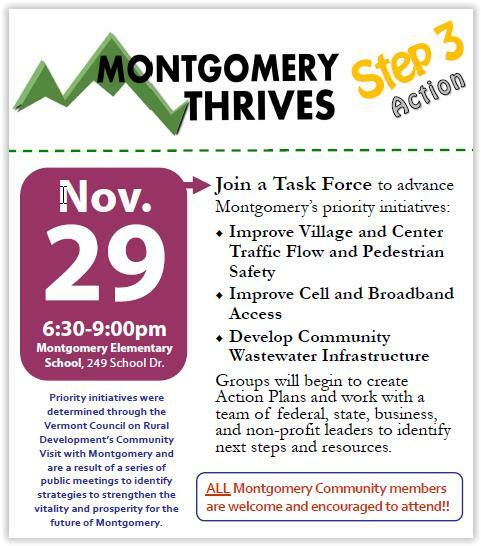 The Vermont Council on Rural Development will hold its last major session in the Montgomery Thrives Community Visit process on November 29th at the Montgomery Elementary School; all Montgomery community members are welcome to help line up action plans to move priority projects forward. On October 22nd around 80 Montgomery community members came together to set core priorities for future action. They reviewed 17 ideas that were gathered from focus forums held in September, and chose priorities designed to boost the community and advance the city’s economy into the future. At the end of the session, participants signed up as volunteers to advance these new initiatives. All members of the Montgomery Community are invited to participate in this third phase of the Vermont Council on Rural Development’s (VCRD) Community Visit to Montgomery. The Vermont Council on Rural Development is a non-profit, non-partisan organization dedicated to advancing rural Vermont communities. For more information, visit http://vtrural.org/programs/Community-Visits. Montgomery has an incredible asset in its two village centers, local businesses lining Main Street, area attractions and scenic beauty drawing visitors to and through town. Many are concerned, however, about the ability of the village and center to handle increased traffic and are worried about the safety of locals and visitors alike. A task force could come together to address these concerns by designing and implementing streetscape and sidewalk improvements as well as traffic calming and pedestrian safety strategies. Efforts may include working with regional and state partners to develop and implement a streetscape redesign plan that could include improved lighting, sidewalks, crosswalks, bike lanes and parking. Additionally, the group could work to implement shorter-term traffic calming strategies such as creative signage (enlisting the help of local artists and youth), flashing speed lights, temporary speed bumps, and other measures to reduce drivers’ speed through town. Many residents expressed the desire to incorporate creativity and beautification efforts into any streetscape redesign plan. Many residents believe that Montgomery lacks the wastewater infrastructure needed for businesses and homes in the village centers, and that developing this infrastructure will be essential to a healthy future for the community. A group could come together to develop a plan for a new wastewater treatment system for Montgomery. A task force could form to work with regional, state, and federal partners to survey current needs, evaluate what is needed for desired growth, identify funding sources, and work with the Select Board to design and implement a Montgomery wastewater project. Montgomery residents would like to have better access to cell coverage and broadband internet access. Montgomery could convene a partnership of local residents, municipal officials, businesses, school leaders, and others to work with regional, state, federal, and private sector partners to bring improved cell and broadband coverage to the community.